The imperative to modernize is clear. Open banking, competition from challengers and non-bank service providers, ISO 20022, and new clearing and settlement options are reshaping the payments business landscape. What’s holding banks back? Legacy payment systems can’t keep up with demand. And the rip-and-replace approach of traditional payment hubs is too slow and expensive to be a viable option. VolPay Omnichannel Preprocessing offers a smart alternative. It’s the fastest way to deploy the most modern payments technology to meet market demand, while simplifying complexity and insulating existing systems from change. Learn more about approaches to modernizing and transforming payments infrastructures while preserving legacy systems - watch the video. An intelligent preprocessing solution that mediates between multiple bank channels, including open API channels, to capture and preprocess payments while retaining existing systems for final execution. 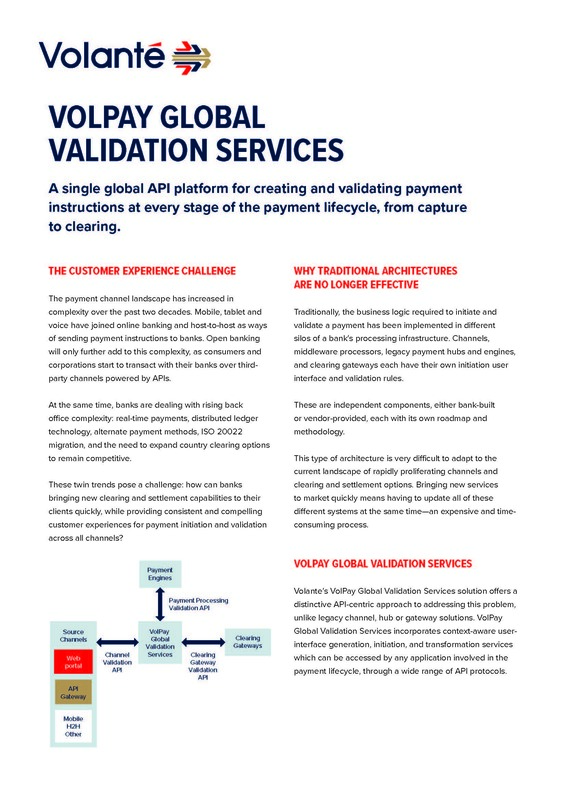 One of the simplest applications of VolPay Omnichannel Preprocessing is as a consolidated location for all payment validations–ensuring that payment initiation channels, processing engines, and clearing gateways all validate payments in the same way and using the same reference data. Volante offers interoperable, extensible solutions for a variety of payments needs, all composed of business services from the VolPay ecosystem.